Spring is here, and the requests for 1st Holy Communion cards have begun! This is the first one that I made for this season. It is for a little boy named (you guessed it) Max. For a different look, I decided not to color the focal image of the little boy. Against the dark color papers, I think he really stands out nicely. Wishing Max and all those children who receive their 1st Holy Communion this year every happiness. 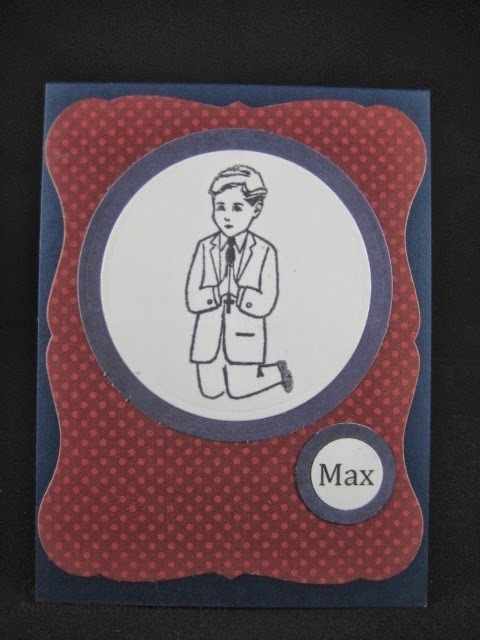 What a great Holy Communion card. So perfect for the occasion. Happy Good Friday, and above all, HAPPY EASTER! This is a great card for the occasion. I think the uncolored image is perfect!